This volume, number 23 in the "Tetrahedron Organic Chemistry" series, presents organolithium chemistry from the perspective of a synthetic organic chemist, drawing from the synthetic literature to present a unified overview of how organolithiums can be used to make molecules. 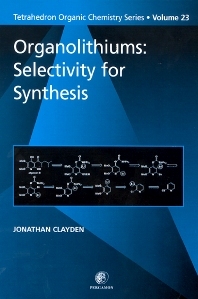 The development of methods for the regioselective synthesis of organolithiums has replaced their image of indiscriminate high reactivity with one of controllable and subtle selectivity. Organolithium chemistry has a central role in the selective construction of C-C bonds in both simple and complex molecules, and for example has arguably overtaken aromatic electrophilic substitution as the most powerful method for regioselective functionalisation of aromatic rings. The twin themes of reactivity and selectivity run through the book, which reviews the ways by which organolithiums may be formed and the ways in which they react. Topics include advances in directed metallation, reductive lithiation and organolithium cyclisation reactions, along with a discussion of organolithium stereochemistry and the role played by ligands such as (-)-sparteine.